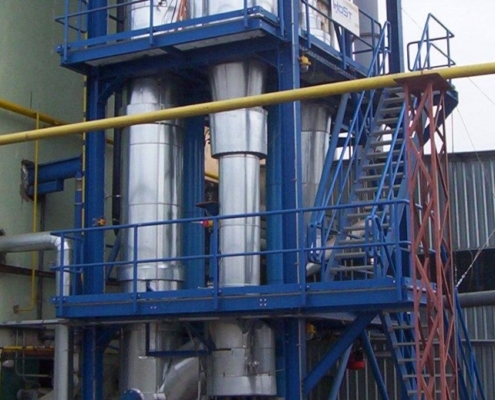 HoSt acts as a turnkey supplier of (air blown) fluidized bed gasifier plants. By means of gasification biomass fuels can be converted to a combustible syngas, which can be cleaned and used in several kinds of power generation equipment. Gasification is a feasible technology for thermal conversion of waste, meeting the strict emission limits. 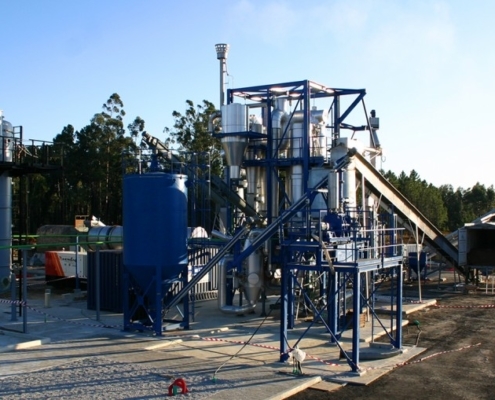 Go to our project page for all fluidized bed gasifier plant projects. As a turn key supplier of power plants, the main focus of HoSt is on applications where the syngas is burned to produce steam for use in a steam turbine. HoSt, in combination with partners, is developing and demonstrating a technology where the produced gas is used in gas engines. In a gasification plant an extremely low emission level can be achieved. In a combustion plant based on grate firing or a fluidized bed reactor, the process temperature is limited to approx. 800 – 900 °C to avoid melting of ash which is present in the fuel. In the HoSt gasification plants the fuel is converted to syngas at the same low temperature level, however the produced syngas is then burned at temperatures of 1400 – 1800 °C in a syngas burner , after removal of low temperature melting ashes. At this high temperature a 100% combustion can be achieved and all harmful emissions (hydro carbons, CO, dioxines) are eliminated. Reports from independent measurement companies are available, which show that absolutely no dioxines are present in the produced flue gasses. Several fuels like straw, sun flower husks, and grasses are difficult to process in combustion systems due to the low melting temperatures of the ashes and the fouling of the downstream boiler components. In the fluidized bed gasifier temperatures can be controlled at levels as low as 750 – 800 °C. Since the syngas is combusted at high temperatures in the syngas burner, no problems with emissions will arise. Boiler fouling in combustion systems is mainly caused by the presence of alkali metals (Na, K, P) in the flue gasses. In the HoSt gasifier concept the produced syngas first is cooled down to around 500 °C. Then, the ash is removed and the syngas is burned. At these low temperatures, the alkali metals condense on the ash particles and are removed from the syngas with the ash. Due to this removal of alkali metals, no excessive fouling can take place in the boiler, increasing reliability and decreasing maintenance costs. As an example, in a conventional system burning sun flower husk, the boiler has to be stopped every 2 -4 weeks in order to manually clean the heat exchanging surfaces. A boiler stop normally requires 2 -4 days to cool down, to clean and to start up again. A gasifier boiler system can be operated for several months between maintenance stops. HoSt has realised multiple fluidized bed gasifiers. Do you need more information or advice? Contact us. We would be glad to assist you and help you in making the best choice.